Victor was born in Suffolk and came from a farming background. He was challenged to serve the Lord while in Cyprus completing his National Service. His wife Meg, was a teacher who originated from Chichester. Together they were called to work in Suffolk after they were married. Victor trained at Moorlands Bible College. After Bible College Victor was active in preaching God’s Word in tent campaigns throughout Suffolk. There were also numerous other meetings, young people’s Bible schools, house parties, training and church missions. In 1967 Victor and Meg led a house party at Culford School, Bury St Edmunds for 150 teenagers over the Easter school break. This work grew and it was soon realised that amongst other things a permanent centre was needed. After much prayer and searching for a suitable centre an agreement was signed in March 1975 for the rental of Sizewell Hall. A council of management was set up with Victor as the director. The Hall and grounds had been neglected for 13 years and needed to be ready for the ‘official’ opening on 17th May 1974. An army of volunteers came every Saturday to tackle work in the grounds and in the house. Within four months everything was ready for the opening. The work of Sizewell Hall had begun. Victor and Meg have three sons, Graham, Michael and Andrew, all of whom are married. As well as being a Director for Sizewell Hall, Victor still had a very busy schedule with Bible teaching, and counselling in the UK. He also lead holidays abroad. He has also been chairman of The Garden Tomb Association in Israel, which is a Christian tourist site in Jerusalem, where the death and resurrection of Jesus are commemorated. He was Chairman of the Billy Graham Crusade held at Portman Road football stadium in Ipswich, when 20,000 people came each night over 5 consecutive evenings. 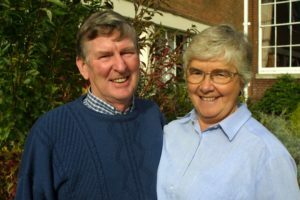 Victor and Meg stood down from the Sizewell Hall Management team in January 2010; sadly Meg passed away in April 2010 after coping with cancer for a number of years. Mark Beaton took over from Victor in 2010 as chairman and after 6 years Mark stood down in 2016, handing over the work to Colin Low. As visionaries for the work at Sizewell Hall, Victor and Meg’s work has been invaluable. Victor will always have the work of Sizewell very much in his heart. We are so thankful to God for all their work over the years. Enter your email address below and sign-up for our free newsletter. You will be taken through to another site MailChimp to sign up. 28 March 2019March 2019 It will Happen!